AN OIL-BURNING LOCOMOTIVE used on the Southern Pacific system of the USA. Since the engine operates in mountain territory, the cab-front (right) is enclosed to give protection. The length of the engine is 121 ft 4½-in; weight, 935,500 lb. The four cylinders measure 24 by 32-in, and the driving-wheels are 63½-in diameter. A MOUNTAIN TYPE of steam locomotive employed on the Pennsylvania Railroad for through passenger service where maximum power is the chief consideration. These locomotives (of the 4-8-2 wheel arrangement) are used also in the special fast freight service. THE WORLD'S LARGEST steam locomotives, of the Yellowstone type, (2-8-8-4) run on the lines of the Northern Pacific between Mandan and Glendive. MODERN LOCOMOTIVE design as seen in New Zealand. A 4-8-4 “K” class used to haul passenger expresses and also heavy goods trains over difficult stretches of country. An unusually large cab is provided for the crew. A BRITISH-BUILT ENGINE in service on the Kenya and Uganda Railway, which is a metre-gauge system. When it was built this engine was the heaviest non-articulated locomotive on the metre gauge in the world. 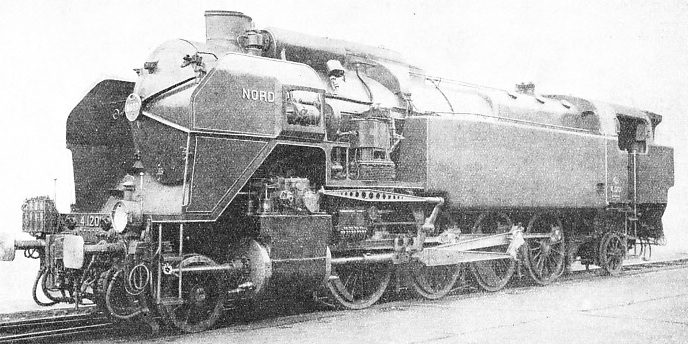 ON THE CONTINENT these French freight locomotives owned by the “Nord” for hauling heavy goods trains, are treated with the respect due to their great power. Their wheel arrangement is 2-8-2, making them of the “Mikado” type. You can read more on “Articulated Locomotives”, “British Express Locomotives” and “Giant American Locomotives” in Railway Wonders of the World.